Not all those who wander are lost. Eureka! Let’s go see what we can find. How To Get: Sheldon is free for the asking, to those who do not have one. Meaning: Sheldon was created as an extension to the Gold Rush set from last year. That set highlighted Sheldon’s journey from New York to the gold fields of California in 1849. After surviving train bandits, buffalo stampedes, a scare from a huge grizzly bear and claim jumpers, he finally made his fortune, with the help of his new friend, Sierra the Grizzly Bear. He definitely deserved a Unique! 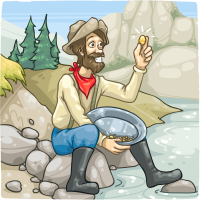 The history of the California Gold Rush is a story that fascinates me, and Sheldon represents all those courageous gold-seekers who gave up everything to head to California to search for gold. Keep your eyes open, Sheldon’s story isn’t over. Which number Unique is this for you? Sheldon was my first Unique. Closing Thoughts: I love Uniques. They add such a personal touch to WallaBee, as most have a personal meaning and story behind them. Collecting them and creating them is my favorite aspect of the game. This entry was posted in Unique Spotlight on October 30, 2018 by WallaBee.